WebJump create great looking, SME websites. In fact, everyone will believe you hired a 'New York' Ad Agency. WebJump is affordable too - from just £995 - including business marketing consultancy. Now with 40% Grant Funding Available. A well-designed Web site builds credibility and enhances the visitor's experience. People often form their first impression about an organization from its Web site. Your Web site therefore needs to be visually attractive, easy-to-use, fully optimized and compliant to industry standards. We manage the complete design process, from the briefing and initial planning stages to final implementation and testing. 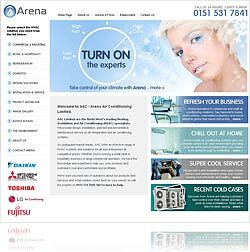 Our design style is creative, clear and organised, to engage the Web site visitor and make your key messages stand out, whether you're selling products or services online. Our meticulous attention to creativity, branding, design aesthetics, search engine optimisation (SEO), functionality, usability and navigation all contribute to making your Web presence second to none. 1 - 5 pages professional web design & development. 5 - 10 pages professional web design & development. 10 - 15 professional web design & development.